TOPEKA — It’s a Christmas wish come true. That’s what Kaylee Gregg said about her family’s plans for Easter weekend. In the weeks leading up to Christmas, Kaylee gave her Christmas list to her parents, Kevin and Shannon Gregg. They did not know how it would change the entire family. “Kaylee put on her Christmas list that she wanted to be Catholic,” Shannon said. 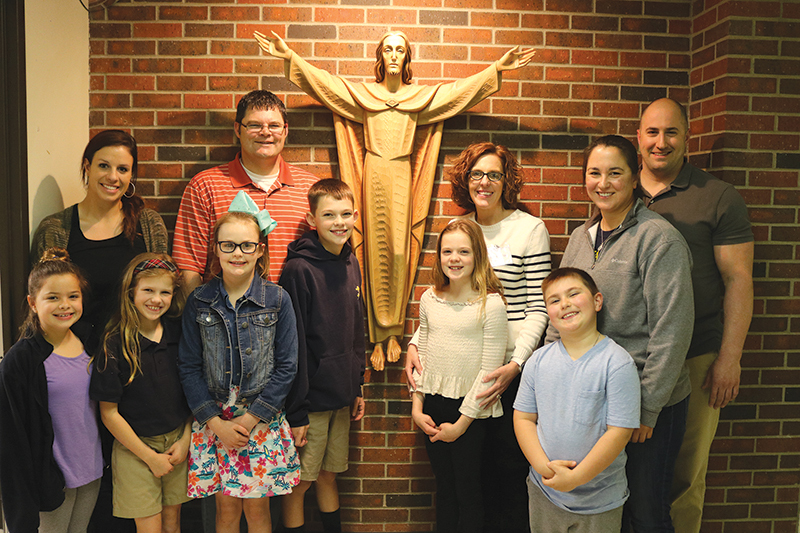 She and her husband, along with their three children — Dylan, Kaylee and Maddie — will join the Catholic Church at the Easter Vigil at Most Pure Heart of Mary Church in southwest Topeka. While it might seem unusual for an entire family to be received into the faith at the same time, the Gregg family won’t be the only one. Josh and Laura Mayer and their son Ben will also become Catholic, as will Craig Matthews, Stefanie Matthews, and daughters Kayden and Emma. After receiving their daughter’s Christmas list, Shannon said she and Kevin realized they had to do something. “I looked at Kevin, and I said, ‘I think we better get started on this now,’” she recalled. The rest, the couple said, was easy. The kids were nearly halfway through their first year at the parish grade school, a decision made to allow them to attend school with their cousins. More importantly, it turned out to be the perfect place for their children to start learning about God and Christian values. “They really started it, and they keep us going,” Kevin said. The children come home every night and share prayers and Bible stories, and it’s the children who keep the family on track for mealtime prayers and Lenten sacrifices. Although the Greggs had to play catch up to the regular class, instructors Karen Madden and Kristi Gosser, pastor Father Greg Hammes, and associate pastor Father Jonathon Dizon helped make it work. “They just welcome you in,” Shannon said. That welcoming attitude is one Laura and Josh Mayer said they found appealing, too. Although the couple was not Catholic, their son has attended the parish grade school since preschool. “His education has always been Catholic,” Laura said. Baptized as a member of a Congregational church, Laura said her early faith life was influenced by her grandfather. Yet, the Catholic Church was always on her mind. “I remember asking to come to Catholic school when I was younger,” she said. Practicing the faith, Josh said, can be challenging. While Laura will be received into full communion as a member of the Catholic faith, Josh and Ben, 6, will be baptized. “I get my sins washed away when I get baptized. I get a restart,” the first-grader said. Getting a restart, said Stefanie Matthews, sounds great. She will be baptized, as will her two daughters. The girls’ father, Craig, will be received into full communion. “I never went into a church. My parents never made us go to church,” Stefanie said. She and Craig have been led by their children. Due to food intolerances, Emma, now 7, spent a lot of time in her young life at Children’s Mercy Hospital in Kansas City, Missouri. She spent part of that time reading the Bible. Like the other children, Emma attends the parish grade school, as does her sister Kayden. ‘We ended up here,” Stephanie said. “Their cousins all go here. “You have a chance to take any journey with your child, and this is what they wanted. Every day, she said, the kids come home and talk about what they’re learning about God and the Christian life. Not only are Stephanie’s children praying for her, but she said they inspire her almost daily. For example, Emma said she’s excited to be baptized because she will become a child of Jesus. Kayden said she’s looking forward to her first holy Communion. “Jesus gets to be in my body,” she said. The Gregg children said they, too, are excited to be joining the Catholic Church this Easter. Dylan, 12, said he looks forward to making his first Communion with his sisters. He’s learned a lot about God so far, but the most important thing he’s learned is how much Jesus loves him. Maddie, 8, said she’s excited to be baptized like her older siblings. “I get to be close to Jesus, and I get to be one of his children,” she said. For Kaylee, the Easter Vigil will finally fulfill that Christmas wish she made. “I still have the list,” she said with a big smile.